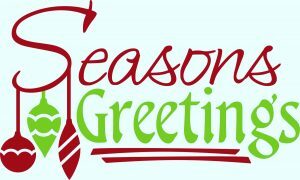 Please note that our office will be closed from 1pm on Monday 24 December until 8.30am on Wednesday 2 January 2019.
no heating / hot water (between 1 Oct – 31 March). Please note, you may be recharged if you call out a contractor and it is found not to be a genuine emergency. If you smell gas, this should be reported immediately to the National Gas Emergency Service on 0800 111 999. 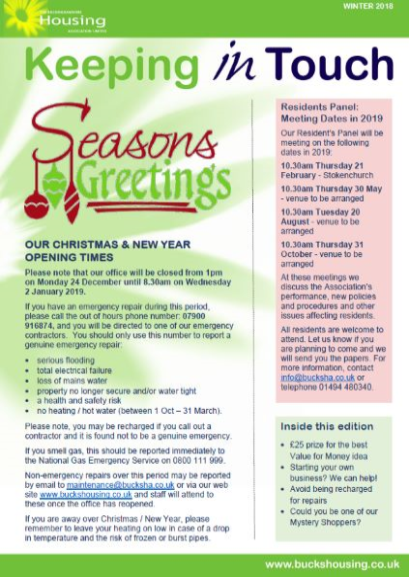 Non-emergency repairs over this period may be reported by email to maintenance@bucksha.co.uk or via our web site www.buckshousing.co.uk and staff will attend to these once the office has reopened. If you are away over Christmas / New Year, please remember to leave your heating on low in case of a drop in temperature and the risk of frozen or burst pipes.